A personalized cancer vaccine safely and successfully boosted immune responses and increased survival rates in patients with ovarian cancer, according to results from a pilot clinical trial. The study supports the use of a cancer treatment that combines different immunotherapies to better tackle advanced ovarian cancer – a deadly disease that is often undiagnosed until later stages. The standard treatment for advanced ovarian cancer consists of surgery followed by platinum-based chemotherapy. However, many patients still relapse after receiving this regimen, with no curative treatment options available. Seeking to develop much-needed new therapies, Janos Tanyi and colleagues created a personalized vaccine for 25 patients with advanced, recurrent ovarian cancer. 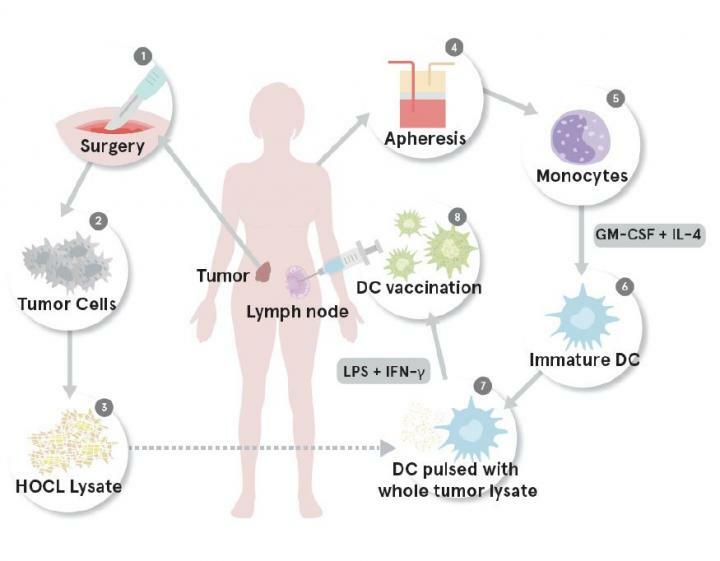 The vaccine consists of immune response-triggering dendritic cells derived from the patient's own blood that have been exposed to tumor material, which can train T cells to identify and infiltrate tumors. The authors administered the vaccine to the patients either alone or in combination with two drugs that modulate the immune system (bevacizumab and cyclophosphamide), and followed them over two years. A total of 392 vaccine doses was well-tolerated by the patients, who demonstrated robust T cell responses against tumor cells. Importantly, patients who received the vaccine in combination with the drugs had a higher average two-year survival rate compared to a group of patients outside the study who only received bevacizumab and cyclophosphamide. Tanyi et al. cautioned the results were preliminary, but say the vaccine's promise warrants future clinical studies.